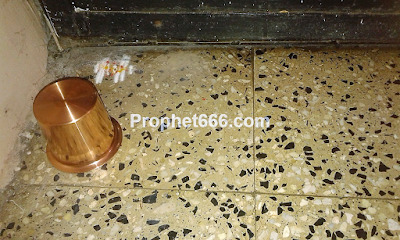 In fact, this paranormal home remedy is so simple that it can be easily tried by any person, including a layperson because there ts no Mantra, Yantra, Puja-Vidhi or any special Tantra needed in order to make the upset family member forget his anger come back to the home. This simple Totka was tried recently by someone known to me and it really worked and the family member who had run away from the house came back within a couple of hours. To practice this Totka, all that is needed is to keep an inverted Small Lota, on one of the outside corners of the main door of the house. The practitioner can use a mug made from any kind of metal, but not a mug a made from clay or glass. After, keeping the mug, the practitioner should say a small prayer that that the family member, who has left or run way from the house, should forget his anger and come back to the house. This small prayer is dedicated to no one in particular, but the practitioner should say it with faith and confidence. The Lota should remain in the inverted position, outside the main door, until the family member returns, after that it should be removed and it can be used once again in the house. This Gharelu Upay can be tried on any day at any time and there is as mentioned above no need to chant and Mantra, Stotra or Prayer or perform any other ritual, apart from what is mentioned in this post. Most of the times, it is very difficult to give any specific explanation or reasoning on how most Tone, Totke and Uapy, including Totke from the Lal Kitab work. But, if you are a follower of these paranormal remedies, then, it is essential to practice them with faith and confidence. Note- Many more such simple and easy to practice Tone, Totke, Gharelu Upay, Voodoo Spells and paranormal remedies of all kinds and for most purposes can be found on the various sections of this site.